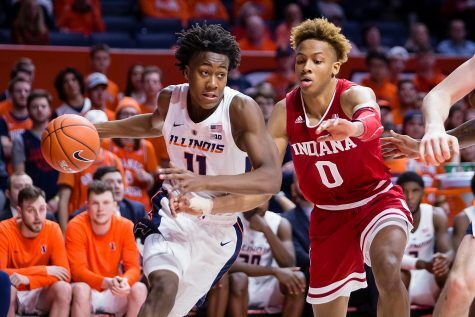 Illinois guard Ayo Dosunmu drives to the basket during the exhibition game against Illinois Wesleyan at the State Farm Center on Friday, Nov. 2, 2018. 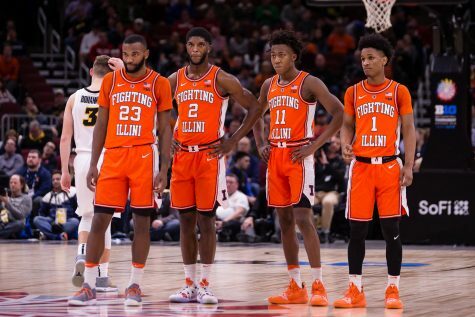 The Illini won 83-67. 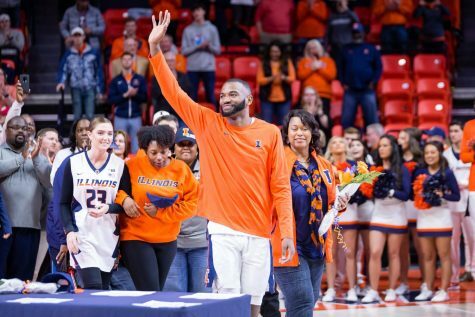 It may have been just an exhibition game, but the Illinois basketball team did not take Illinois Wesleyan lightly on Friday night, winning the contest 83-67 with strong performances from its newcomers. 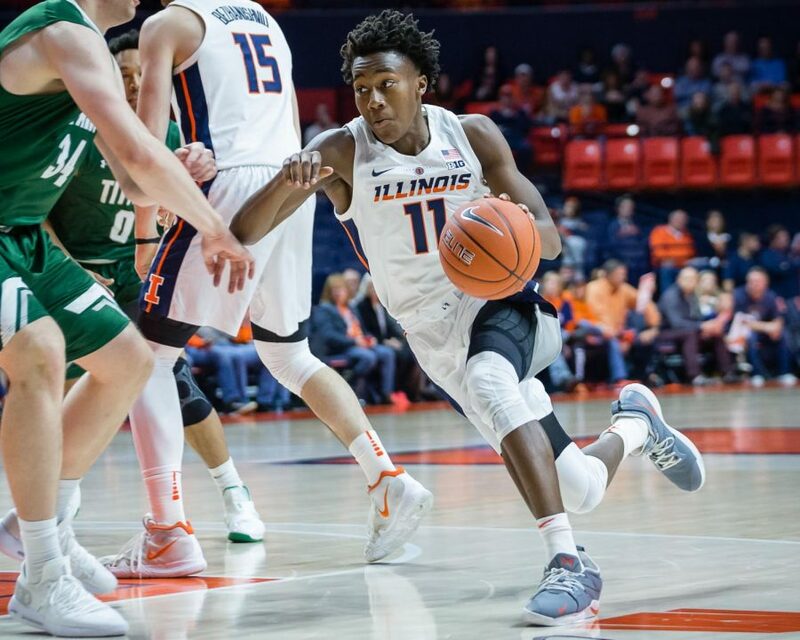 Junior college transfer Andres Feliz made an impressive debut as an Illini, leading all scorers with 20 points in just 25 minutes. Feliz also tacked on five rebounds, two assists and a steal. 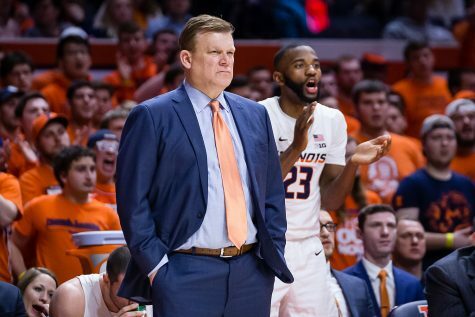 The Illini guard came off the bench, but head coach Brad Underwood trusted him with ample court time, as Feliz registered more minutes than everyone except for sophomore guard Trent Frazier and freshman guard Ayo Dosunmu. Frazier picked up right where he left off last season, scoring 19 points, three of which opened the game on a pull-up three-pointer. Frazier had an efficient night, shooting six-of-nine from the field and assisting on five other baskets. One of those assists was a lob to Dosunmu, who finished with a smooth layup. Frazier played his usual brand of basketball, seemingly flying all over the court while also drawing most of Wesleyan’s defensive attention. 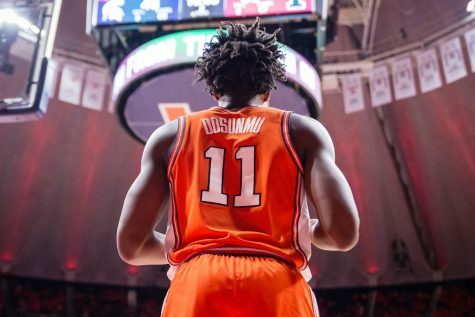 One of those young guys, star recruit Dosunmu, had a productive night. Drawing the start at point guard, he registered the most court time of any player at 29 minutes. 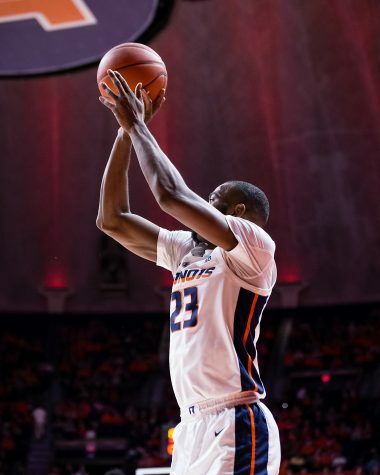 Dosunmu ended the first half having shot just three-of-six from the field with six points but ended the contest six-for-10, scoring 13 points. The freshman only registered one assist and one rebound, but he was still active on the court with four steals. 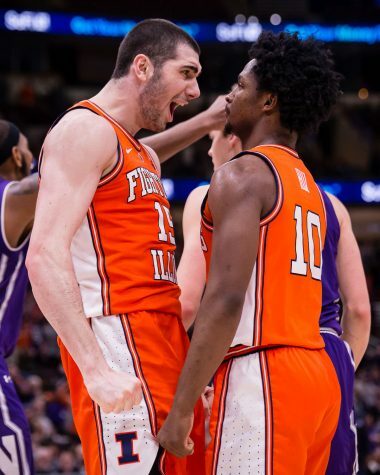 The star of the night, though, was freshman center Giorgi Bezhanishvili who started against the Titans. Bezhanishvili had nine points by the end of the night, with both of his buckets being three-pointers. Unfortunately, the incident earned him a technical foul, which led to the center recording only 14 minutes overall. 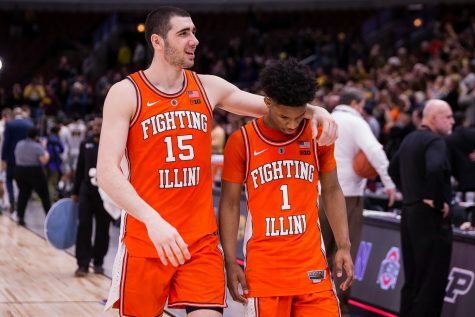 However, it is clear Underwood has faith in Bezhanishvili and feels he plays a key part on this team. Elsewhere on the roster, seasoned junior Kipper Nichols didn’t have his best night, scoring just three points on one-of-ten shooting. He still recorded 25 minutes on the floor and is one of Underwood’s most trusted guys heading into the season. Senior Aaron Jordan also had a good game, starting at small forward and leading the team with seven rebounds while also recording nine points and two assists. Only four players recorded fewer than nine minutes against Wesleyan: sophomore Zach Griffith, freshman Samba Kane, junior Drew Cayce and junior Samson Oladimeji. The most surprising of the bunch was Kane, who some expected to start upon his arrival. 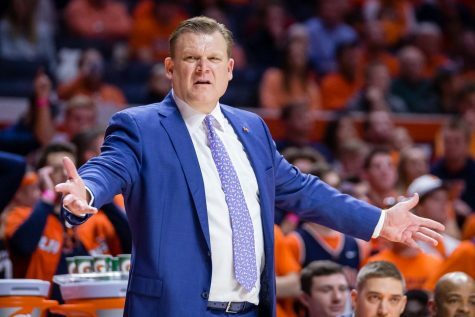 Underwood clearly hasn’t given his full trust to the freshman yet, which could change. 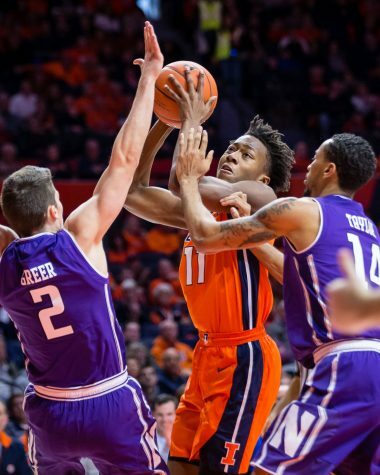 Illinois will host Evansville on Thursday for Maui on the Mainland as a tune-up for their trip to Hawaii for the Maui Invitational.